Endotoxin Testing Market Growth, Future Prospects, and Competitive Analysis, 2018 – 2026” the endotoxin testing market expected to grow at a CAGR of 9.5 % during the forecast period from 2018 to 2026. Escalation in demand for novel therapeutic drugs and medical devices has been the major factor that has led to the growing demand for endotoxin testing globally. Endotoxins can lead to pyrogenic response and symptoms of septic shock. Bacterial endotoxin testing is an essential safety requirement in the biomedical and pharmaceutical industries. Due to technological advancement, new endotoxin testing methods such as recombinant Factor C assay and monocyte activation test have been developed and distributed commercially on a global scale. The quality control tests for endotoxin testing must fulfill with regulatory requirements imposed by the European & U.S. Pharmacopoeia and the U.S. FDA. The limulus amebocyte lysate (LAL) assay test is widely utilized for pharmaceutical and biotechnology products or devices. Presently, topmost researchers trust on the conventional LAL assay test. With comprehensive understanding of endotoxin detection, new biosensors based on endotoxin-sensing components are favorable alternatives to pursue in evolving easy-operation, low-cost, and quick-response endotoxin detection methods. 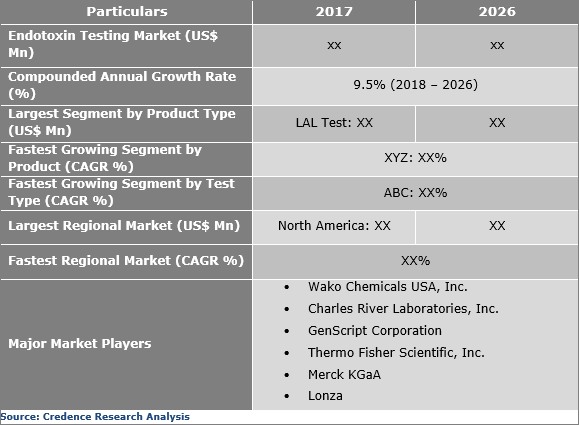 Development of endotoxin testing market is driven by growing technology assessment in biologics, usage of MAT test, Recombinant Factor C assay, and increase in manufacturing of medical devices, biotechnology instruments/systems and pharmaceutical productsInstruments segment expected to show productive growth globally. Availability of wide range of products such as mycoplasma detection & removal, PCR mycoplasma detection kit, endotoxin removal products, low endotoxin recovery (LER) products and lipopolysaccharides with top applications will gain traction globally. Additionally, preference for animal-free tests is gaining popularity; new product launches along with increasing partnerships will drive the market growth successfully during the forecast period. However, less availability of advanced kits and instruments, strict regulations for medical devices, high investment for research, and affordability issues are the key factors limiting the market growth during the forecast period. Endotoxin testing is imperative in the course of drug and medical device development for ensuring the absence of pyrogenic substances. Availability of top detection systems are gaining traction in the global market from top manufacturers such as ToxinSensor™ endotoxin detection system, PyroMAT™ System, Kinetic-QCLTM Kinetic Chromogenic LAL Assay, PYROGENTTM Gel Clot LAL Assay and others. New product launch with strong linearity, high sensitivity and reproducibility will further generate revenue share globally. However, as of late, different issues have emerged about the discovery dependability of LAL testing for specific samples in which endotoxin is not fully covered. This alleged low endotoxin recovery phenomenon is a relevant issue nominated by the endotoxin testing community. Methods such as limulus amoebocyte lysate (LAL) assay, rabbit pyrogen test (RPT), monocyte activation test (MAT) and recombinant factor C assay are employed in endotoxin testing, of which LAL testing will witness the fastest growth during the forecast period from 2018 to 2026. LAL method had been used for pyrogen testing method for over 30 years for the detection of endotoxin. Monocyte activation test is an in-vitro method and is newer to the industry. Growing demand for animal-free testing methods and the proven high precision of LAL tests contribute to the dominance of this segment. It is observed that LAL tests are continuously replacing RBTs and are being recommended by pharmaceutical companies and international bodies. Additionally, expanding availability of several types of methods, such as chromogenic endotoxin testing, gel clot endotoxin testing, and turbidimetric method, are likely to lift the potential of the overall market globally. Overall demand of biologics has prompted the need for more LAL tests and tachypleus amebocyte lysate testing globally. North America captured the largest revenue share in 2017, followed by Europe in the endotoxin testing market in 2016, and it is expected that the region will continue to retain its dominance through the forecast period 2018-2026. Being large and diversified, the U.S. is the largest and the most critical market for endotoxin testing. The country houses several occupations ranging between scientific researches and manufacturing. Expanding number of techniques with endotoxin testing alongside rising approvals from the U.S. FDA are relied upon to drive development of the worldwide endotoxin testing market. The Asia Pacific market is expected to indicate fast development in endotoxin testing market, attributable to heavy investments in pharmaceutical and biotechnology industries, along with rising adoption of advanced kits and systems for cancer research and development of vaccines, biologics, and drugs. Moreover, rising burden of chronic diseases in developed nations is also expected to drive the inclination of researchers toward advanced technologies. 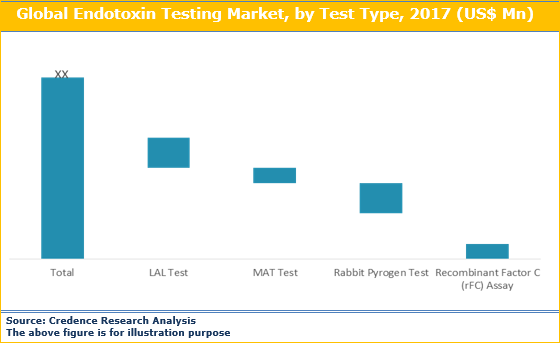 Major players in the endotoxin testing market are Accugen Labs, Wako Chemicals USA, Inc., Charles River Laboratories, Inc., Pacific BioLabs, Sigma-Aldrich Co. LLC. Lonza, STERIS, Nelson Laboratories, LLC, Bio-Synthesis Inc, Biogenuix, Ellab A/S, GenScript Corporation, Thermo Fisher Scientific, Inc., Merck KGaA and others. Top manufacturers are employing growth strategies along with approvals for new endotoxin testing detection kits and systems. For instance, In Nov 2018, Lonza declared recombinant Factor C assay has been utilized for endotoxin testing Emgality™ drug by Eli Lily. In 2016, Charles River Laboratories, Inc. acquired Blue Stream Laboratories, Inc. to further enhance its analytical research capabilities for biologics development and safety assessment. This study report represents analysis for each segment from 2016 to 2026 considering 2017 to be the base year. Compounded annual growth rate (CAGR) for each of the respective segments estimated for the forecast period from 2018 to 2026. 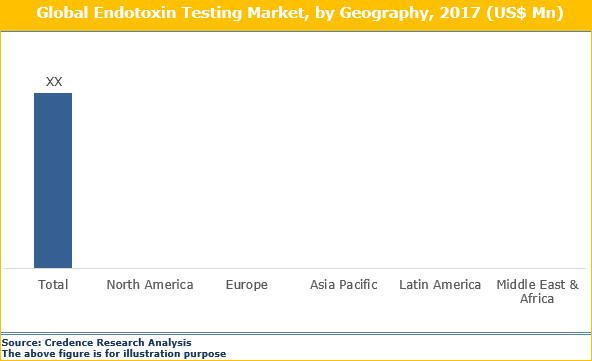 Endotoxin testing market report comprises current market trends and dynamics along with quantitative analysis of the global industry. 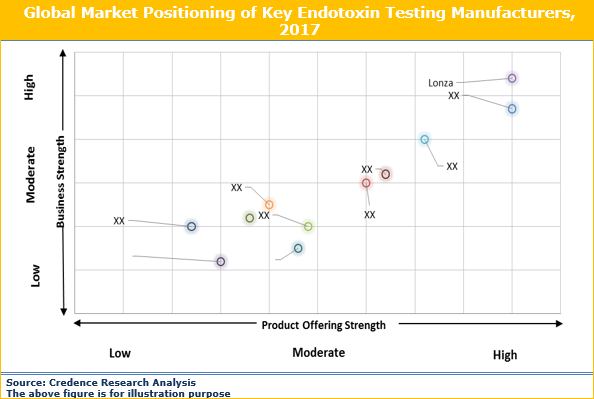 The report elucidates thorough information of global endotoxin testing market by segmenting the market in terms of product type, test type, application, and geography. This report would guide healthcare professionals and market players in decision-making and strategizing market position. What are the current market trends and dynamics in the endotoxin testing market and valuable opportunities for emerging players? What is the positioning of major key players operating in the market? Which segment accounts for the fastest CAGR during the forecast period? Which end-user holds a larger market share and why? What is the impact of high cost of screening tests on the endotoxin testing market? 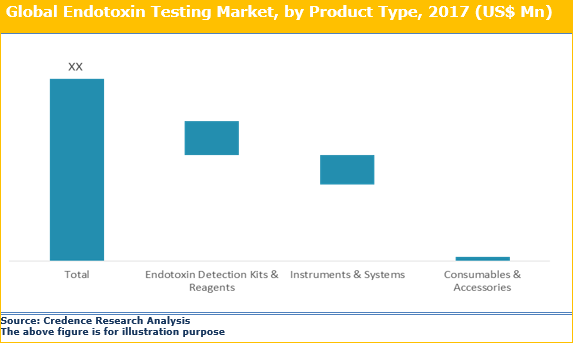 To what extent are low and middle-income economies investing in the endotoxin testing market? What are the prevailing trends and dynamics in emerging markets such as Japan, Latin America and Middle East & Africa?